For those who know I have just been on a marvelous nine day holiday in Bali. I have in the past always thought of Bali as a copy watch and Bintang singlet/knock off handbag/get your hair braided sort of holiday spot. I however been completely surprised on the destination. I am putting together a collections of posts that will cover what we did, where we stayed, ate and shopped and hope that it will help you if you ever step foot in the great holiday destination. Being a Bali "virgin" I did a heap of research on where to stay, eat and shop. We stayed 6 nights in Legian and 3 nights in Seminyak. Lets just say I spent at least two weekends reading reviews going to the hotels or villas direct sites and Tripadvisor to see what was good, bad or indifferent. It absolutely drove me crazy, I couldn't choose. Finally I picked the Pullman in Legian that resides between Kuta and Seminyak. 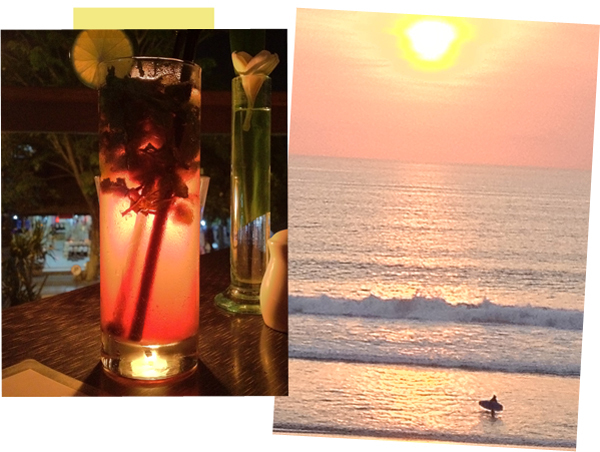 Our last three nights we booked the W Spa and Resort in Seminyak for a little treat/splurge. Both resorts were lovely. The Pullman was clean and fairly new. The rooms were spacious. The most important point was we didn't need to fight for a sun lounge. We had no grand plans to site see, ultimately we were there to relax and pretty much do nothing. I did yoga on the infinity pool deck at 7am as the sun rose or went to the gym for a workout. We had an ocean facing view and watched the sunset each night from our balcony or from the Infinity pool deck (with a drink in hand!). The W Spa & Resort in Seminyak was the creme de la creme. As soon as we arrived it was WOW! I highly recommend this as a place stay. We were only there for 3 nights but we got the most out of the resort. The staff (or as they are formally called at the W, Talent) were amazing! There was always someone there to help and assist for anything. Come back tomorrow for my complete review on the W! Bali is so nice place to visit,I visit this place twice in a month or spend my amazing days at here..